(Host) On Town Meeting Day, Montpelier voters will decide whether to adopt a local tax on sales, rooms and meals. The new revenue is supposed to ease the burden on local property taxpayers and help repair the city’s crumbling streets and sidewalks. But as VPR’s John Dillon reports, the tax proposal has outraged many businesses in the Capital City. (Dillon) Peter Foote mans the cash register at the Uncommon Market, a Montpelier corner grocery store that also sells deli sandwiches, fresh fish and gourmet foods. (Foote) "It’s actually been a store, a food store of some kind, since 1905, and maybe earlier. But I have a picture here dating it to 1905." (Dillon) On this day, Foote has a sign on the counter for all his customers to read. 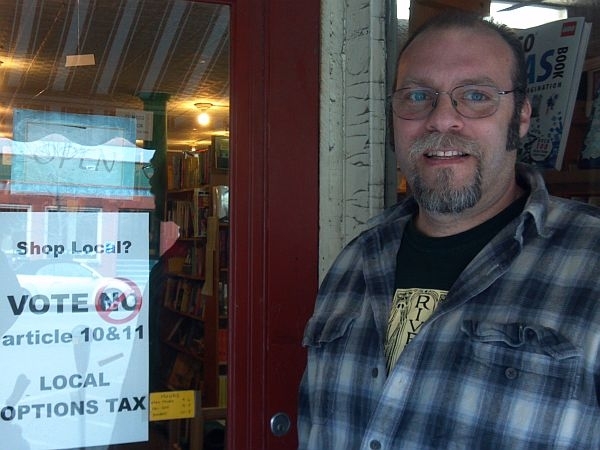 (Foote) "Shop local, vote ‘No,’ article 10 and 11, local options tax. Yeah, there’s a local community group passing these around today, and we’re going to put this up on our door." (Dillon) Voters will be asked to raise both the rooms and meals tax and the sales tax by 1 percent. Foote says the potential new tax on the prepared food he sells sends the wrong message to his customers – and to local businesses. (Foote) "We have an incredible selection of locally owned businesses, which is I think what makes the town as attractive as anything else does. And to make it more difficult for those small business people to make a living, I think, is the wrong decision here." (Dillon) That same sentiment can be found behind almost every counter and storefront in Montpelier, the nation’s smallest state capital. Rob Kasow owns Rivendell and Bear Pond, classic bookshops made for browsing where the floors creak and the shelves wind around corners. Amazon it’s not. But that’s his competition. (Kasow) "Most independent family-owned businesses are swimming against the tides of history right now. And I hope that the public understands that part of the charm of downtown Montpelier is the fact that we don’t have chain stores. But we’re all struggling in a world where the decks are stacked against us in many ways. I think making us less competitive than we already are is going to be a real devastating blow to a lot of businesses down here." (Dillon) Kasow and other critics say Montpelier city government has overextended itself, and should be cutting budgets, not raising taxes. But Bob Gross, a retired state tax official, says the city needs the money. And he says the local option tax could help ease the burden on residential taxpayers. Gross sees the two new taxes as a way to spread the burden of providing city services to the thousands of people who visit and work in Montpelier every day but live somewhere else. (Gross) "We have a higher municipal tax rate because we are not a city of the number of residents that we have. We are a city that grows to 20,000 people during the day who are not paying for it." (Dillon) Montpelier Mayor Mary Hooper makes the same argument. (Hooper) "We have more people per capita come in to Montpelier than any other community in the state except for Williston. And it’s because of these operations that are there. And so what we’re doing is asking them to pay a portion of the cost of providing the services." (Dillon) Not all businesses are opposed. National Life, a life insurance company that employs hundreds, is neutral on the tax question. Other, smaller local businesses are not neutral at all. Terry Youck owns the Savoy Theater, a business that like others in the city has weathered two floods and a lengthy recession. He says he’ll have to absorb the tax rather than pass it to customers. He wants the city to cut its budget instead. (Youck) "They are basically shuffling this on to the visiting consumers who come in to Montpelier, which I think is disingenuous, because it’s really not their problem. We want to encourage those people to come to Montpelier, not penalize them." (Dillon) Twenty-two towns around the state have one or both of the local options taxes. Manchester passed a local sales tax in the late 1990s. Jeffrey Wilson was town manager at the time. He’s now a state representative. As in Montpelier, Manchester merchants worried about the tax hike. But Wilson says the tax didn’t have much impact on local businesses. (Wilson) "We didn’t see any problems whatsoever as far as people fleeing to some other area of the state or modifying their buying habits." (Dillon) Steve Jeffrey of the Vermont League of Cities and Towns says no town has repealed a local option tax. That’s a sign, he says, that the communities are satisfied. You’ll find Montpelier’s town meeting warning and much more coverage of Town Meeting Day issues at Public Post, VPR’s local news service. A tax on sugar sweetened beverages has run into trouble in the House Ways and Means committee. But the panel is seriously considering a plan to impose the state sales tax on soda and candy. Brattleboro will decide this week whether to approve a proposed one percent local option sales tax, which town officials say will generate funds to improve fire and police stations.